How do you like to unwind after a long day? Getting together with friends? Enjoying a beer or glass of wine? How about focusing your mind and hands on something new and creative, rather than the stresses of the workday? 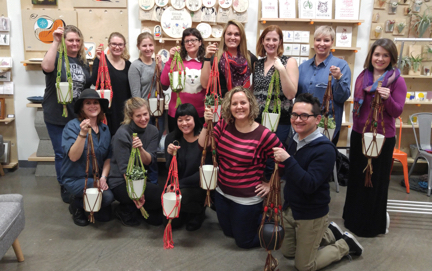 Well, our macrame plant hanger workshop on a recent fall Wednesday evening provided all of the above! The sold out class gathered students at Nucleus Portland, where Liz and new class assistant, Noelle, showed them the ropes. Wrap knots, square knots, and overhand knots... add a plant pot... and you've got yourself a modern macrame plant hanger! Interested in taking this class too? Well, sign up and join us! 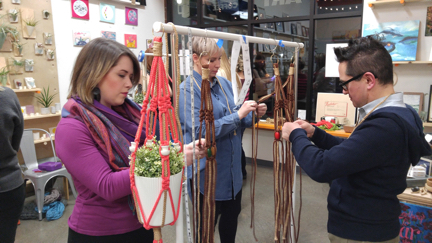 Assembly’s macrame wall hanging class at Perks of Art in Hillsboro taught students how to be properly knotty! A 70’s icon, macrame has recently made a trendy comeback. So much so that our first class of the day sold out... so we added a second! Attendees enjoyed their French press coffee or wine while making a modern piece to enhance their homes. The multiple knots learned gave folks the know-how to tackle future projects and many students purchased the macrame kit to create more at home! Macrame Wall Hanging Workshop Retreat at the Coast! Did someone say ROAD TRIP!? Students made the trek out to the Sou'wester Lodge on the Long Beach Peninsula to learn that what's-old-is-new-again skill of macrame, once a 70's icon, now making a big comeback. Our delightful group of students from Astoria to Tacoma to Portland learned the fundamental knots to create modern wall hangings. Thanks to all of our students for making the trip as well as the Sou'wester for being wonderful hosts for the second year in a row! Students gathered at Perks of Art in downtown Hillsboro on a rainy evening and found out what it means to get knotty! They practiced their knots, selected their colors, and then got to work on their macrame plant hanger. By the end everyone had enjoyed a beverage, met someone new, finished their piece, and indulged Liz in a group photo. Thanks again! To knot or not to knot? Is that even a question? Of course we knotted! Our October 1st macrame plant hanger workshop brought together a great group of students to learn the basics of macrame and practice their skills to make a neat plant hanger to take home. The Beech Street was the perfect hangout on this rainy night with its autumnal music, hot cocktails, and vintage ambiance. As we found out from this class, our events are perfect for couples on dates, bringing a parent or grandparent to revisit a craft they did decades ago, or just individuals looking for something fun to do with other like-minded people! Check out our facebook and instagram pages for more photos from this event. Mason Jar Leather Sleeve Workshop in full swing! Who says summer school isn't fun? Our recent series of craft workshops in August at the Sou'wester Lodge on the Long Beach Peninsula in Washington proved otherwise! A special thanks to our first group of amazing students and the Sou'wester Lodge for their wonderful hospitality! Be the first to know about upcoming Assembly craft & DIY workshops and events! Sign up with your email address to receive the latest updates and news. Thank you friend! We'll be in touch.